More treasures from the June 1858 Godey's Lady's Book I found on my bookshelf this past week. Above are 2 quilt patterns. They are clearly applique patterns. While titled Patchwork Patterns, there is no way to piece these fascinating designs! I wonder if anyone every made a quilt with one of them! Here are a couple embroidery designs. The alphabet stops with R. I guess they assumed you could extrapolate the S-Z! And lest you think that designers of modern quilting fabric have some sort of monopoly on the use of arrows, check out this hair ornament! She wouldn't make it through a 21st century security check!! 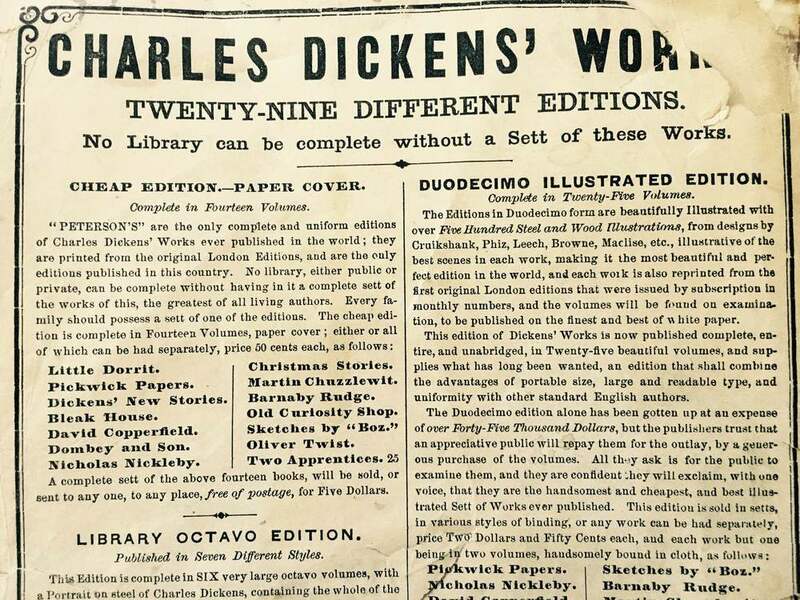 And finally, an ad for books by Charles Dickens! It's a full page ad but I focused in on the offering of the "Cheap Edition". $5 for 14 books or 50c each, shipped postage free! Part of a full page ad for books by Charles Dickens in various editions.